Imagine a learning environment where an acclaimed Chef Educator is right by your side, giving you the personalized attention you need to master culinary or pastry techniques. The majority of your day is hands-on, experiential learning. You start and finish the program with the same cohort, acquiring the essential teamwork skills you need in the workplace. Our mentoring process is the best way to learn the craft of cooking. Our philosophy is to offer affordable tuition to anyone with an appetite for a culinary career and a desire to enrich the fertile fields of culinary or pastry arts. 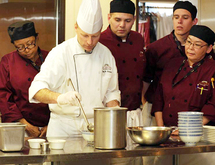 We’re proud of our diverse student community, their commitment to the kitchen and their accomplishments throughout the industry, and we are committed to offering outstanding culinary instruction to all who share our passion. Financial aid is also available for those who qualify.